-Accommodation in Benamahoma, San Antonio 83 and San Antonio 71 Portal B and D.
- Pets are allowed informing of your stay and conditions must be accepted. (Ask us the price of your pet's stay). -Vivienda Rural in Benamahoma, San Antonio Street 83. -Establishment with category "Gay Friendly". -Rural house on two floors (140 square meters) with back ground and parking in the same door. -Capacity up to 12 people. (INCLUDING CHILDREN). -Living room with wood fireplace, (We supply wood at very cheap prices), Led TV 42 "Full HD with HDMI connection, TV by satellite Movistar Series, Family and Freeview. -Connection Wi-Fi internet without limits, 10 megabytes of speed. -4 rooms, three of them with built-in wardrobes: 2 with double beds and 2 with single beds. A small sitting room on the upper floor with a double bed, and a sofa bed in the main living room. Equipped with blankets and sheets. Towel service at € 3 per person. Ironing board and iron. -Heating and air conditioning on both floors. -2 full bathrooms, one with bath and the other with shower. Hair dryer. -Fully equipped kitchen with two refrigerators, microwave with grill, washing machine and all the necessary utensils. -Patio with coal barbecue adjoining Monte de las Encinas. -Marvelous views of the Sierra del Albarracín and Mount Las Encinas. -Capacity up to 7 people. (INCLUDING CHILDREN). -House of 90 square meters with fireplace, air conditioning and heating. -Connect Wi-Fi to internet free without limits to 10 megabytes of speed. -3 bedrooms with wardrobes, two with double bed and one with two single beds and a child extra bed. They put sheets and blankets. Towel service at € 3 per person. Iron with ironing board. -Living room with wood burning fireplace, (We supply wood at very low prices), Led TV, Full HD with HDMI connection, Movistar Satellite TV, Family and Freeview. -Kitchen with fridge, washing machine, microwave with grill, fully equipped. -Patio with charcoal barbecue and with views of the Mount de las Encinas. -Marvelous views of the Sierra del Albarracín and Mount de las Encinas. -Capacity up to 4 people. (INCLUDING CHILDREN). -Approach about 10 meters from the door. - House of 65 square meters with air conditioning and heating. -Connect Wi-Fi Internet connection without limits at 10 megabytes of speed. -2 rooms. (One with double bed and extra bed, and the other with two single beds). They put sheets and blankets. Towel service at € 3 per person. Iron with ironing board. -Bathroom complete. with bath of 1.50 m. and hair dryer. CATALOGED BY THE COUNCIL OF TOURISM. No. VR / CA / 00201. 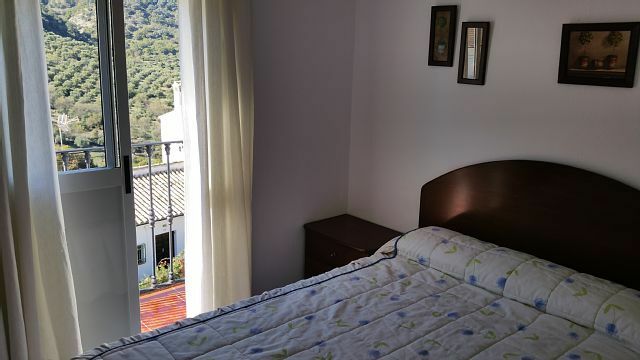 -Accommodation Rural in Benamahoma, San Antonio Street 83. - Pets are allowed informing of your stay and conditions must be accepted. (Ask us the price of your pet's stay). -Establishment with category "Gay Friendly". -Rural house on two floors (140 square meters) with back ground and parking in the same door. -Capacity up to 12 people. (INCLUDING CHILDREN). -Living room with wood fireplace, (We supply wood at very cheap prices), Led TV 42 "Full HD with HDMI connection, TV by satellite Movistar Series, Family and Freeview. -Connection Wifi free internet without limits at 10 megabytes of speed. -4 rooms, three of them with built-in wardrobes: 2 with double beds and 2 with single beds. A small sitting room on the upper floor with a double bed, and a sofa bed in the main living room. Equipped with blankets and sheets. Towel service at € 3 per person. Ironing board and iron. -Heating and air conditioning on both floors. -2 full bathrooms, one with bath and the other with shower. Hair dryer. -Fully equipped kitchen with two refrigerators, microwave with grill, washing machine and all the necessary utensils. -Patio with coal barbecue adjoining Monte de las Encinas. -Marvelous views of the Sierra del Albarracín and Mount Las Encinas.